Photo left shows Eric Hardwick M.B.E. presenting The Admiral of The Fleet Lord Boyce with a 'Ghost of Dunkirk' Hastings Brass,at the Ceremony to Bless the Boat and The Flag that saved so many lives at Dunkirk. Without question, one of the most popular changes we made in our thirty four years, was to change from a medal to a brass award for each finisher. These unique brasses, which every year have featured different aspects of Hastings, from 1066 through to such famous people as John Logie Baird, Grey Owl, and even our own ‘Banksy’ (still able to see on the St. Leonards promenade), have in some cases to be so well sort after as to be sold on Ebay. They have certainly become collector’s items in their own right. These fine English horse brasses have been made since the Middle Ages to decorate horse harnesses. Since the time of Queen Victoria, many different designs have been made, but the Hastings brass each year remains a unique award. 'The Ghost of Dunkirk' (real name 'Cyril and Lillian Bishop') Lifeboat, helped to rescue an estimated 3000 troops from Dunkirk. It made nine trips per day for four days. A young fusilier, who was swimming in the Sea in 1940 trying to get off the Dunkirk Beach, said ‘Out of the mist and the smoke came the lifeboat like a ghost and it saved my life. She had been bombed, she had been machine-gunned, she had two bullet holes in her’. We actually have one of the bullets found in her, she had a hole in her bow where she had been bombed, and her top light on her mast was full of sand where she had rolled over. This Hastings Lifeboat was found in France by Deeday White, and purchased from the owner so it could return to its Home at Hastings. Deeday’s Father used to launch the Lifeboat in Hastings during the 1930’s. It was in a very bad state of disrepair, but with the enthusiasm of Deeday, and local business’s it has been fully restored, and is now on display on the corner to the left of The Bourne going into All Saints Street as you are running the Half Marathon just after 10 miles. Having last year been reminded of the heroic evacuation with the film DUNKIRK, it was even more important that this Hastings Boat was restored and put on display for all to see. The brass above is set upon a Leather Martingale, and is a great way to display your brass. The Martingales can be purchased from Race Centre, or 'online' at www.hastings-half.co.uk and there are options to have singles or doubles, or Martingales that will hold four, six or eight brasses. 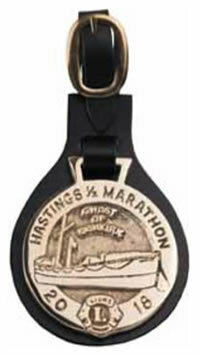 You can also have a tab added to the back of your brass, with your race details. Go to www.mysportingtimes.com to book them. We trust that you will appreciate and enjoy our Hastings brass for 2018. Martingale and a 'No Pins Pack for £5.' plus p&p.